St. Basil feat. 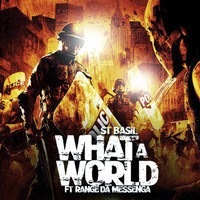 Range Da Messenga - "What A World"
This is the lead single for Voice of The People EP, featuring the talented and soulful artist Range Da Messenga and produced by Flawless. A dynamic look at the social climate of the urban communities and the propaganda that befalls us. What a world we live in.